Our cozy log cabins are situated in a pristine, sunny location with a tremendous view over snow capped mountains, glaciers, dark blue lakes and endless forests. In this quiet, beautiful surrounding it is easy to relax and get the strength for your next adventure. Go for a hike – explore the gold rush trails – visit the museum – stroll through the historic town of Atlin – observe wildlife – enjoy the large variety of flowers – have a swim in the Warm Springs – rent a canoe or kayak and paddle or fish on one of the many lakes around Atlin that have an abundance of lake trout, grayling and pike. We are located 12km/8miles south of Atlin on Warm Bay Road. 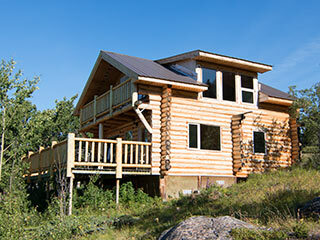 The Cabins have a large deck with a propane BBQ, a kitchen and a bedroom. Linen and dishes are included. 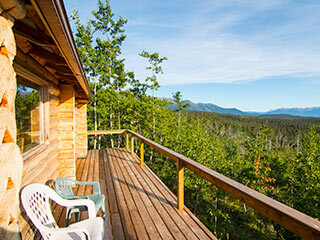 For exploring the Atlin area as well as easy access to our cabins we recommend that you rent a car in Whitehorse. We rent canoes and kayaks. 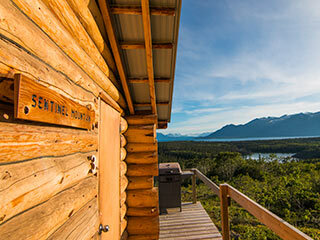 The ideal way to explore Atlin’s stunning setting.